Aleva Hifo secures the ball for what would become BYU's longest pass play of the season (Steve Connor, AP Photo). For a half, it looked like the BYU Cougars were going to limp into the offseason with a losing record for the second year in a row. Fans were going to have plenty to be disappointed about. 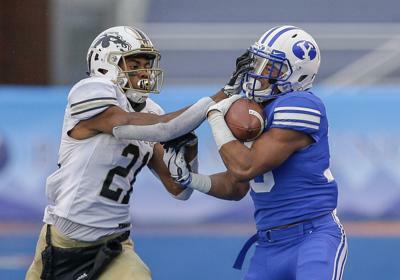 BYU trailed Western Michigan 10-7 at halftime of the Famous Idaho Potato Bowl. The Cougars' only score came after Western Michigan shanked a punt and gave BYU a very short field. Poor execution and very questionable coaching decisions led to the Broncos scoring 10 straight points to end the half. BYU was on the verge of going 0-2 versus the Mid-America Conference this season. It completely contradicted the narrative that the Cougar program was headed in the right direction after posting two more wins than 2017, and playing close games with Boise State and Utah. BYU looked like the same undisciplined group from a year ago. They were getting outmanned on both sides of the ball, and the all royal blue uniforms imitating Boise State on the blue turf made it look like a program with identity issues. With all that going on, it was easy to overlook that Sione Takitaki had 12 tackles in the first half, and Zach Wilson was 8 of 8 passing. In football it is very hard to beat a team when a quarterback is having a perfect game, and as the Utah game painfully taught, it is, usually, better to win the second half than the first. BYU received the second half kickoff, and opened up the offense to take advantage of the Broncos' defensive commitment to stopping the run. Wilson connected with Neil Pau'u for 48 yards on the first play. Two non-penalty plays later, Dylan Collie caught his second touchdown of the game. Takitaki and the defense struggled in the first half to get off the field, but in the third quarter, the only way Western Michigan could get a first down was if BYU roughed the punter. Wilson scrambled for 11 yards to start BYU's second drive of the third quarter. He then completed two more passes. By this point, the success throwing the ball had opened up running lanes. That allowed Riley Burt to find a nice hole to run through. He then used his breakaway speed to split two defenders and score from 37 yards out. Burt finished the game with 13 carries for 110 yards. BYU now led 21-10, but it was the next sequence of events that made it clear the ball was definitely bouncing BYU's way. After the Cougar defense forced a three-and-out, BYU's returnman fumbled the punt. Two Western Michigan players had a chance to recover it, but could not before the ball went out of bounds. That blunder was followed by Wilson getting sacked for a loss of seven yards on first down. It gave the impression the Cougars were unraveling. There was still plenty of time for the Broncos to stage a comeback, if BYU lost its composure. That's when Wilson found Aleva Hifo streaking downfield one-on-one. Hifo made a sneaky, one-handed catch, shook off the defender, and went the rest of the way for a 70-yard touchdown. Western Michigan was the team unraveling now. Just two plays into its ensuing drive, the Broncos quarterback forced a throw downfield that was intercepted by Austin Lee. Lee returned it 26 yards to the Western Michigan 32 yard line. Western Michigan was called for roughing the passer on the next play, and defensive holding two plays later to give BYU a first and goal. Offensive coordinator Jeff Grimes dialed up the same goalline played used at Utah that scored an easy touchdown. This time, however, it was defensive back Dayan Ghanwoloku taking the pitch from Austin Kafentzis before Kafentzis turned into a lead blocker making it an easy score. Ghanwoloku has scored on interception and fumble returns in his Cougar career, but this was his first offensive touchdown. It capped an explosive 28-point third quarter to put the game out of reach, 35-10. When BYU got the ball for the first time in the fourth quarter, the only suspense was whether Wilson would finish the game with 100 percent completion percentage. Two fantastic catches by Matt Bushman and Dylan Collie made sure Wilson did. Bushman reached over the defender to turn a risky throw into a first down. Collie made a diving catch and managed to stay in bounds for a sensational 31-yard grab. The cherry on top for Wilson was two plays later. He scrambled and found a wide open Dax Milne for touchdown number four. Wilson was 18 for 18, and the 42-10 lead assured his day was done. It is a new BYU record for completion percentage in a game. It ties the NCAA record, and the 18 consecutive completions is second most in a NCAA bowl game (one shy of the record, 19). Western Michigan scored a touchdown and two-point conversion for pride. Then, the game got sentimental. Idaho native Tanner Mangum replaced Wilson at quarterback. In the final game of his turbulent college career, not only did he get to play in a winning effort, he had a nearly perfect feel-good ending. Mangum and Collie were both part of the same 2012 BYU recruiting class. Neither one had the type of career in Provo that they were expecting six years ago. It was only fitting that Mangum and Collie connect for both players' final throw and catch. It was good for 41 yards. Mangum finished with a higher pass efficiency rating tham Wilson (444.4 to 321.3). Collie finished with six receptions for 124 yards and two touchdowns. Easily his best game as a Cougar. Brayden El-Bakri scored from one yard out to make the final score 49-18. Sione Takitaki finished the game with 19 tackles (1 sack). That ties Uani Unga and Butch Pau'u for most tackles in a game since 2000, when tackles became an official NCAA stat. PLAY OF THE GAME: Mangum to Collie for 41 yards.